Vessel, tube, pipe, or other container within which a chemical reaction is made to take place; may be batch or continuous, open or packed, and can use thermal, catalytic, or irradiation actuation. an apparatus used in carrying out chemical reactions. The design and operation of chemical reactors are dictated by the state of aggregation of the interacting substances and by the conditions (temperature, pressure, reactant concentrations) required to ensure the desired reaction rate and direction. According to the first criterion, a distinction is made between chemical reactors designed for reactions in homogeneous systems (single-phase gaseous or liquid) and reactors used for heterogeneous systems (multiphase, for example, gaseous-liquid-solid). The second criterion is used to classify reactors as low-, medium-, or high-pressure; low- or high-temperature; and batchwise, semicontinuous, or continuous-operation. Chemical reactors for homogeneous systems generally take the form of tanks equipped with mixing devices and heat-exchange elements. Sometimes, however, the reactors are columns, which are either empty or packed, often with pancake coils. Processes in homogeneous systems can be batchwise or continuous. Reactors for heterogeneous systems are primarily column-type, either single-step or sectioned, more rarely tank-type. The processes in column reactors can be batchwise, with an alternating introduction of reactants and removal of reaction products; semibatchwise, where certain reactants are introduced at the start of the process while other reactants, usually gaseous, are passed through the reactor in continuous fashion during the course of the reaction; cyclic, with an alternating occurrence of various processes, for example, catalytic reactions alternating with catalyst regeneration reactions; or continuous, where there is a steady flow of reactants through the column, the reaction occurring during the time of passage. The characteristics of a continuous process hardly vary with time. In batchwise operation, tank reactors for homogeneous and heterogeneous systems are equipped with mixing devices to accelerate heat and mass exchange and ensure a uniformity of conditions inside the reactor. With continuous processes, which are generally used in industry, a thorough mixing in the tank is not desired because it lowers the reactor’s yield and interferes with the selectivity of reactions by varying the residence time of the interacting particles; that is, some particles pass through too rapidly and fail to react, while others are impeded. This effect is suppressed by using a series of reactors of the type in question. Flow-through chemical reactors—tubular and column—are most widely used for heterogeneous systems. Tubular reactors permit a vigorous heat exchange in the reaction zone and ensure a uniform residence time for all particles in the flow. Column reactors are structurally less suited for vigorous heat exchange and therefore are used in those cases where an addition (or removal) of heat to the reaction zone is either unnecessary or is carried out on a limited scale. These reactors are sometimes filled with solid packing in order to accelerate the mass exchange between phases and reduce the variation in residence time of the reactant particles. For reactions involving both a gaseous and liquid phase, a broad surface between the phases is achieved by dispersing one of the reactants. In column reactors, it is very important to have a uniform distribution of flow through the column’s cross section. When necessary, flow-through reactors are equipped with circulation loops for recycling any substances that did not react. The selection of an operating pressure in reactors of all types is dependent on the nature of the reaction, the state of aggregation of the reactants, and such economic factors as energy consumption and metal content. High-pressure chemical reactors are often employed in large-scale industrial production, for example, in ammonia synthesis (Figure 1). Temperature control in chemical reactors is ensured by the distribution in the reaction zone of various heat-exchange elements, such as jackets, coils, and bundles of tubes. In some cases, the reaction zones are separated either by heat exchangers or by direct intakes of cold reactants or inert gases (Figure 2). 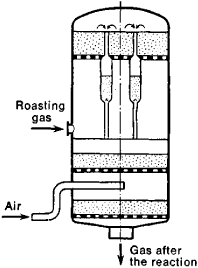 The addition or removal of heat is effected by independent heat carriers or by the heat from the outgoing flow, which is then used to heat the entering substances. This latter technique is sometimes subject to instability effects, which can lead to an inadmissible warming or cooling of the reactor and a cessation of the process. Chemical reactors with homogeneous catalysts are structurally no different from noncatalytic types. 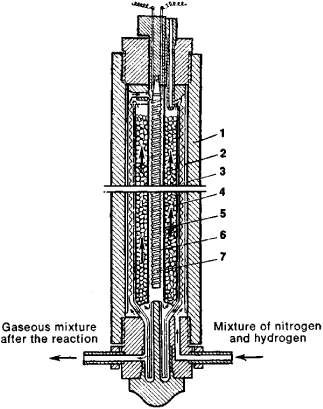 In tank reactors with mixing operations, a solid catalyst may be used in the form of a fine suspension or, more often, in the form of particles that constitute a fixed bed and fill a tubular or column apparatus. Owing to the low thermal conductivity of this bed in the reactor, substantial drops in temperature are possible. A reduction in particle size speeds up reactions because of the enlarged surface area but leads to a reduction in the thermal conductivity of the bed and an increase in the bed’s hydraulic resistance group; in practice, therefore, particles with diameters of several millimeters are used. A diagram of a catalytic contact apparatus is shown in Figure 3. Fast reactions are often carried out on grids made of a metallic catalyst. Chemical reactors with fluidized and moving beds have characteristics that set them apart from other reactors. The advantages of these reactors include the possibility of a continuous intake of fresh solid phase and removal of depleted solid phase, a high rate of heat exchange, the lack of dependence of the hydraulic resistance group on the speed of the fluidizing agent (gas, vapor, liquid), and a wide range of properties of solid particles (including suspensions and pastes) and fluidizing agents. However, the use of reactors with fluidized and moving beds is limited because they do not ensure a uniform residence time of the particles of the two phases in the beds, do not preserve the properties of the solid phase, and require powerful recovery equipment for fines. 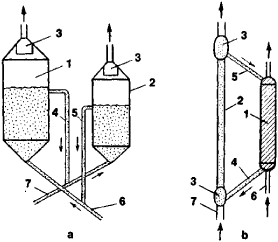 Chemical reactors with moving (sinking) granular beds are used in carrying out continuous processes in heterogeneous systems with a solid phase (Figure 4). The design of reactors for electrochemical and plasma processes is highly specialized. 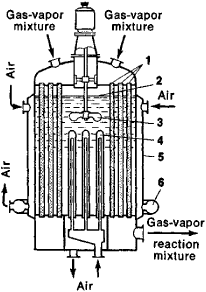 Chemical reactors with screen drives, which obviate complex packing devices (stuffing boxes), are employed in carrying out reactions that require a mechanical mixing of reactants, especially at medium and high pressures. for ensuring a given yield include the volume, flow rate, heat-exchange surface, hydraulic resistance group, rate of catalyst substitution, and various structural parameters (particularly in the case of high-pressure reactors). Design computations involve the use of experimental data on the kinetics of reactions, catalytic poisoning, and the rates of heat and mass transfer. Electronic computers are used for detailed reactor designs, which include a determination of temperature and concentration contours, a determination of the optimum scheme for heat exchange and recycling, an analysis of the stability of a particular mode of operation, and the selection of parameters for the control devices. There is currently a tendency toward the inclusion of high-power apparatus in the construction of reactors. Aris, R. Analiz protsessov ν khimicheskikh reaktorakh. Moscow, 1967. Ioffe, L. I., and L. M. Pis’men. Ihzhenernaia khimiia geterogennogo kataliza, 2nd ed. Leningrad, 1972. A vessel in which chemical reactions take place. A combination of vessels is known as a chemical reactor network. Chemical reactors have diverse sizes, shapes, and modes and conditions of operation based on the nature of the reaction system and its behavior as a function of temperature, pressure, catalyst properties, and other factors. Laboratory chemical reactors are used to obtain reaction characteristics. Therefore, the shape and mode of operation of a reactor on this scale differ markedly from that of the large-scale industrial reactor, which is designed for efficient production rather than for gathering information. Laboratory reactors are best designed to achieve well-defined conditions of concentrations and temperature so that a reaction model can be developed which will prove useful in the design of a large-scale reactor model. Chemical reactions may occur in the presence of a single phase (liquid or gas), in which case they are called homogeneous, or they may occur in the presence of more than one phase and are referred to as heterogeneous. In addition, chemical reactions may be catalyzed. Examples of homogeneous reactions are gaseous fuel combustion (gas phase) and acid-base neutralization (liquid phase). Examples of heterogeneous systems are carbon dioxide absorption into alkali (gas-liquid); coal combustion and automobile exhaust purification (gas-solid); water softening (liquid-solid); coal liquefaction and oil hydrogenation (gas-liquid-solid); and cake reduction of iron ore (solid-solid). Chemical reactors may be operated in batch, semibatch, or continuous modes. When a reactor is operated in a batch mode, the reactants are charged, and the vessel is closed and brought to the desired temperature and pressure. These conditions are maintained for the time needed to achieve the desired conversion and selectivity, that is, the required quantity and quality of product. At the end of the reaction cycle, the entire mass is discharged and another cycle is begun. Batch operation is labor-intensive and therefore is commonly used only in industries involved in limited production of fine chemicals, such as pharmaceuticals. In a semibatch reactor operation, one or more reactants are in the batch mode, while the coreactant is fed and withdrawn continuously. In a chemical reactor designed for continuous operation, there is continuous addition to, and withdrawal of reactants and products from, the reactor system. The Kronecker Summation Method for Robust Stabilization Applied to a Chemical Reactor. A chemical reactor is constrained by heat and mass balances, and by the second law of thermodynamics. Developing targets for the performance index of a chemical reactor network: isothermal systems. The chemical reactor is a vessel with a double wall filed with a cooling medium. The textbook is for an introductory undergraduate course on chemical kinetics and chemical reactor design for students of chemical engineering. Chemical reactor analysis and applications for the practicing engineer. Their integrated and interdisciplinary approach allows in-situ monitoring of the LbL growth process as well as the response of the resultant film to environment stimuli using novel optofluidics, in essence, a chemical reactor and an optical interrogator all within a specialty optical fiber. The enhanced technology of this chemical reactor allows vessels from 50 mL to 5 L to be used with a common clamp, lid, circulator and stand. It can be used in applications such as blast testing, rocket motor acoustic studies, engine inlet acoustic studies, shock wave studies, chemical reactor monitoring, and aerodynamic studies. The reason behind the blast is believed to be increase in the temperature of the chemical reactor. Along with the tools engineers need to design and specify chemical reactors, he covers the fundamentals and principles of chemical reactor design, presents techniques for dealing with the properties of reactors of all types and purposes, and explains the method of false transients. Bradford Coroner's Court heard yesterday how Mr Shone, 35, had been discovered slumped at the bottom of an empty 20ft chemical reactor at Grosvenor Chemicals in Linthwaite (pictured) in the early hours of Friday, October 8, 2004.